Christmas in the early years of America's life describes the life of a younh girl names Helen. Living on a farm before the time of telephones or cars, Helen spends her days working on the farm, walking to school in the cold of winter and spending time with her family, hearing stories of her ancestors. Helen's Christmas begins in the summer when her family plants the food that will be eaten on Christmas morning and their Christmas spirit stays alive throughout the year by helping ill and injured neighbors with tasks around their farms. Christmas is a time for Helen's family to come together from all over and build their relationships over feasts, church, midnight skating and fun. 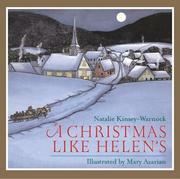 Kinsey-Warnock, Natalie, “A Christmas like Helen's,” Children's Picture Book Database at Miami University, accessed April 19, 2019, https://dlp.lib.miamioh.edu/picturebook/items/show/13839.